It's Wednesday and I'm blogging!! Try not to faint with shock. I haven't done a Wednesday post because I haven't both worn something cute AND been able to snap a decent pic. Sure, I've had a few outfits (you know, on the few occasions I leave the house and actually do something) that were kinda cute, but I wasn't organized enough (or had enough time without one of the three children hanging off of me) to get a pic. Don't let the previous sentences fool you into think this post is going to contain great quality, child-free pics, guys, that's just not my life. So, with the Valentine's theme in mind this week, I'm sharing my go-to Valentine's outfit AND makeup! Let's start with makeup (yay). I LOVE makeup.I have always loved playing with makeup but don't always have time to really "do" my makeup. Often it's the minimum which for me means filling brows, mascara, tinted moisturizer and, of course, my LipSense. This is all good and fine for an everyday look but I love to take it up a notch whenever I have the opportunity (mostly because there aren't many opportunities lol). Pre-kids, I used to go out often and that meant a full face of makeup which included false lashes. I love false lashes because they make me feel quite glamorous and my natural lashes leave something to be desired. Plus, false lashes are a fun and easy way to jazz things up or add a little va-va-voom, especially to your Valentine's Day or date-night look. I was sent some Esqido mink lashes to try. Before I tell you my thoughts, you need to know that I get offered products regularly and don't post a lot of review/sponsored posts anymore unless it's something I genuinely want to try. I could not ignore the opportunity for some new lashes (and for any excuse to find a place to wear them lol). I see a difference, do you see a difference? I think the before and after kind of speaks for itself. I chose the "Radiance" Esqido mink lashes and was also sent the eyelash glue. I chose the "Radiance" ones because I felt they looked kinda natural. My goal with lashes is for them to be noticeable but not like "WHOA", ya know? As you can see from the before and after above, you can definitely notice a difference with the lashes on but it's not so dramatic that you couldn't pull it off for most events (including the baby shower I attended and SuperBowl party (aka "This is Us" party) that we had. Aren't they pretty? Even from the top down it's not obvious I'm wearing lashes but they look gorgeous!! Even my mom was like "you look great, I love your eye-makeup" but couldn't pinpoint what was different until I told her. Goal achieved! My thoughts? I loved these lashes!! I also love that they're reusable (I've worn them twice, both times with ease). I have tried many (MANY) false lashes in my days. There have been a few different glues that have bothered or irritated my eyes and I'm happy to report I had absolutely zero issues with the eyelash glue from Esqido. The application was very easy for me and I liked that the glue didn't take too long to dry and wasn't noticeable once dry. The lashes feel very light (I've worn some heavy lashes and can't handle the weight) and natural, both attributes essential for this makeup-loving momma. They often have buy one set, get the second 50% off and if you're a lash-loved, I'd highly recommend grabbing a set (or two)! Plus, if you order now you'll have them in time for Valentine's Day!! Well, this mom will likely be doing a dinner at home once the kids are in bed because who wants to volunteer to watch 3 kids? Anyone? Bueller? So comfort is key but that can be done kinda cutely... right? I love this Addy Poncho I recently got from Stella & Dot. It's soft and cozy so I feel like I'm wearing pajamas but don't look like I just rolled out of bed. Don't mind the socks, we don't wear shoes in the house in Canada (well, most of us don't I think) and the boots I wore in the snow aren't exactly fashion-forward lol. Also, my mini-me was insistent on getting in on the action, obviously. You all can just pretend you don't see the baskets of unfolded laundry in the background, um 'K? Stella & Dot selling tops is going to be the end of me (or rather by bank account). I have the maroon one in the middle below and I think that would also make a great night-out outfit too! Don't tell Mr. B, I have that top but have yet to wear it. D'oh! Again, anyone up for babysitting? 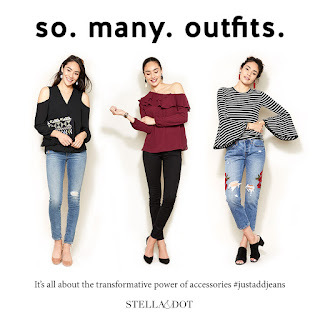 Link up below and share your outfit posts with my friends and I at the Blended Blog!! Can't wait to see what you're wearing!